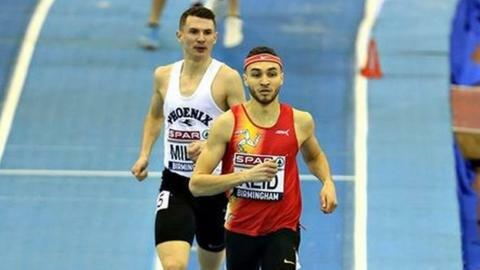 Isle of Man athlete Joe Reid said he was "buzzing" after running a personal best time to qualify to represent Great Britain at next month's European Indoor Championships. The recently-crowned British indoor 800m champion clocked a lifetime best of 1:47.83 to finish third at the Birmingham Indoor Grand Prix. The race was won by Australia's Joseph Deng with GB athlete Jamie Webb second. Reid's time was well within the 1:48 time needed to represent GB in Glasgow. The 23-year-old, who represented the Isle of Man at the 2018 Commonwealth Games, said: "I'm buzzing. It is a feeling of sheer happiness and now I can really enjoy the build up to Glasgow. "I've always believed I belong it that quality of field and I'm not fazed by it." The Cardiff student continued: "In indoor 800m races anything can happen, so don't write me off! I'm confident and anything could happen." ‪British Athletics have named Reid amongst a record-equalling 48 athletes to compete at the championships in Glasgow from March 1-3. Reid will become the first-ever athlete from the Isle of Man to represent Great Britain & Northern Ireland at the major indoor international championships.